You would think that by October, the schedule ordeal would be over. But you would be forgetting that scheduling is never complete! There are changing service times, students making progress and graduating, and of course new referrals! There are so many instructional priorities within the short school day, even at the elementary level – core literacy, math skills, social and small group opportunities, active move-around time, exposure to science and technology. It can be challenging to work within all these shifting activities while ensuring that all students get to do things they enjoy and are good at, are exposed to new ideas and concepts, and have adequate time and support to work on things that are hard. 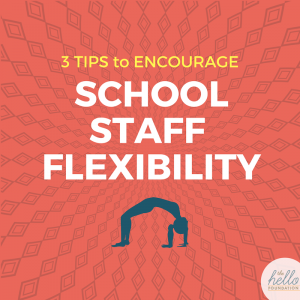 Teachers, other specialists, and administrators are on your team to serve these students, and managing priorities requires flexibility all around! Be flexible or demand flexibility? That student that takes a long time to walk down the hall? The fact that the music schedule changed after you finally fixed your 2nd grade therapy time? Sometimes you have to laugh! And take a deep breath before diving into it all again. Our students have lots of demands on them, and IEP teams design services to support student success. If you are having trouble coming to a consensus on a particular student’s schedule, maybe it’s time for a team meeting to look at service minutes and talk about what the priorities are. Keep the big picture in mind!